Oct. 25, 2018, 7 p.m.
Have you ever wanted to improve the accuracy of media coverage about American Muslims? Here's your chance! 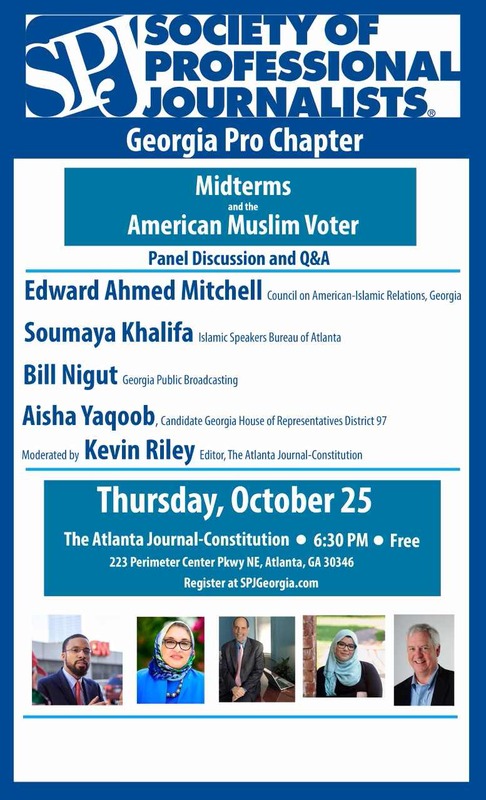 Join Georgia journalists and Georgia Muslims at the headquarters of the Atlanta Journal-Constitution on Thursday, Oct. 25th, at 7 pm for "Midterms and the American Muslim Voter." Please register online for this FREE event, which includes dinner from Halal Guys. Whether as elected officials, political candidates, voters, activists, or even as political punching bags, American Muslims play an increasingly prominent role in the electoral process. As a result of these and other current events, journalists often find themselves reporting on issues related to the Muslim community. Given widespread confusion and debate about American Muslims and their faith, many journalists are making greater efforts to ensure that their coverage of the Muslim community is ethical, fair and accurate. To that end, please join Georgia journalists and Muslim leaders on Oct. 25th. Doors open at 6:30, and the event starts immediately after Maghrib, God willing. Come with questions—and an appetite! Edit This Event Last Edited By: Edward Ahmed Mitchell on Oct. 18, 2018, 1:41 a.m.